What do you do because you love to do it?! No one is watching. No one is cheering you on. No one is telling you, “good job.” No one is paying you. No one is waiting for it. No one cares…but you. What do you love doing so much that you don’t care what anyone else thinks? What do you love doing so much that you don’t care whether you get paid for doing it or not? What do you love doing so much that even when it gets hard or difficult, you still want to do it? 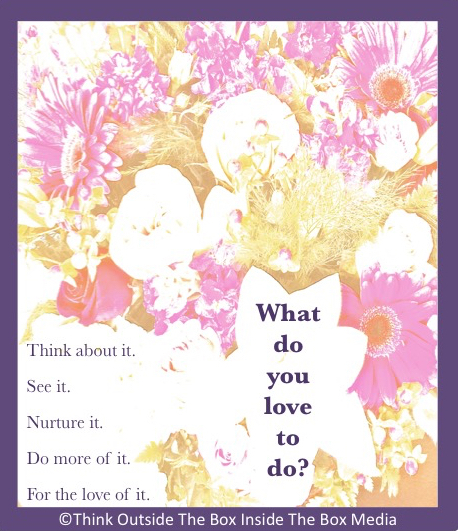 What do you love doing so much that you do it simply for the love of it? Reading, writing, singing, quilting, gardening, running, skiing, baking, building, cleaning, computer programming, care giving, saving, working, studying, learning, educating, motivating, sharing, discovering, traveling. What’s your thing? Don’t limit yourself. You might do many different things for the love of it. Give yourself more time to do the things you love to do just because you love to do them.